I received family admission to the Georgia Aquarium in order to facilitate this review. Family time is precious. I can’t believe how fast my kids are growing! It is always fun to do new educational, fun things with my kids. I love to see them learn and have new experiences. That is why I was totally excited when I got the invitation to go see the Georgia Aquarium. I knew that visiting the Georgia Aquarium would make for a memorable, educational and fun a day together as a family. 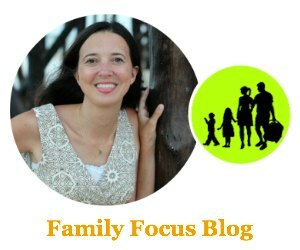 I knew that it would be just as enjoyable for my husband and I as it would for the kids. Now that is good family fun! We drove from Nashville, Tennessee to Atlanta, Georgia in about 3 and half hours. 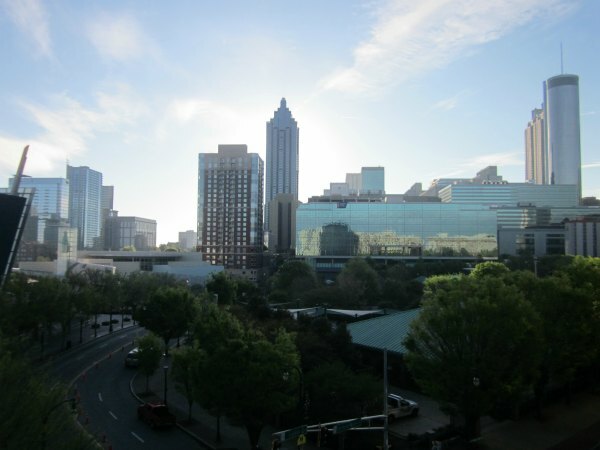 We stayed overnight at the Hilton Garden Inn in Downtown Atlanta. We enjoyed our stay- it was very clean, comfortable and we had good service. To relax after the drive, we all soaked in the Hilton Garden Inn hot tub and swam in the pool. Then we walked just across and up the street for a lovely German meal at Der Beirgarten. There was a model train that ran around a track suspended from the ceiling and the kids loved that. I had the best German food I have ever had in America. Very enjoyable. The next morning we walked over to Centennial Olympic Park for a bit to sight see and then we headed over to the Georgia Aquarium. It was nice being so centrally located and able to walk to everything and not worry about parking. The Georgia Aquarium is really amazing! They have so many things that you can never get to see at any other aquarium. It is truly a special experience. One of four amazing whale sharks at the Georgia Aquarium! The Ocean Voyager exhibit steals the show. It is incredible. Home to whale sharks and manta rays, the Ocean Voyager is the world’s largest aquarium tank with 6.3 million gallons of water. It has an amazing tunnel so you can walk through and around the humongous tank and see amazing sites from all over. With four beautiful whale sharks, enormous manta rays, huge groupers, black tip reef sharks, and way, way more, you are sure to be gapping the whole time. 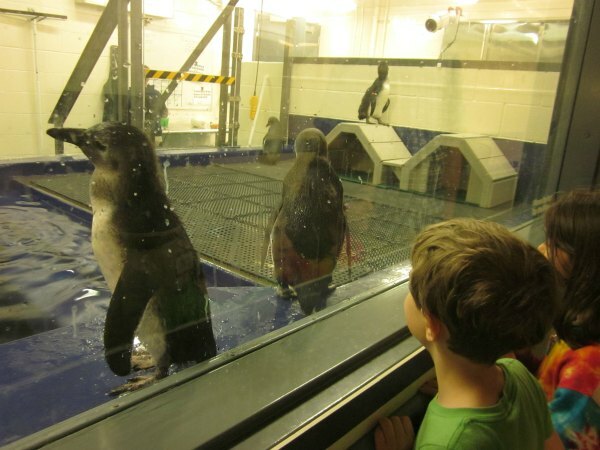 You can watch literally thousands of animals from the largest viewing window in North America! Awesome. Beluga whales, sea dragons and a mini kelp forest are a few of the attractions that give you a glimpse of the rich variety of life found in cold ocean waters. Penguins, sea otters and touch pools will capture your attention and make you want to linger longer. 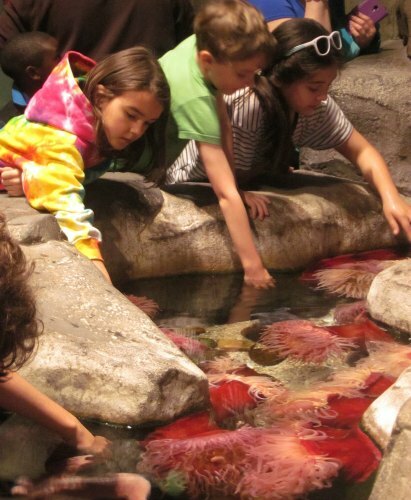 My kids loved touching the anemones! The River Scout exhibit gives you access to the wide diversity of animals found in the rivers of Africa, South America, Asia and even Georgia. From piranha to American alligators, the rivers come to life. This exhibit is just gorgeous and makes me long for a snorkeling vacation where I can just spend hours looking at all those colorful fish. Living corals and thousands of colorful reef fish recreate a tropical Pacific coral reef with a huge viewing window. I was able to take a behind the scenes tour and I was amazed to see how they fill up and dump these huge tanks across the exhibit to recreate the wave effect. 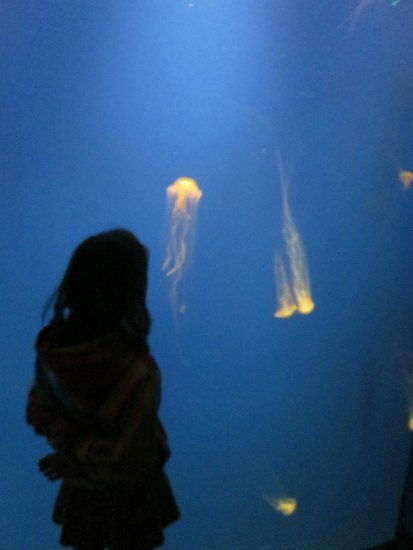 The jellyfish were also awesome- all kinds and of all sizes! You kids may enjoy doing a jellyfish craft at home later as a way of remembering all the fun they had. A loggerhead sea turtle, lionfish and several touchpools provide an up-close encounter with animals native to Georgia. The AT&T Dolphin Tales Show is a theatrical performance incorporating actors, dramatic costumes, music, singing, amazing effects and of course, dolphins! I loved watching the dolphins and the trainers interact and the dolphins did amazing tricks! I would love to watch that again. 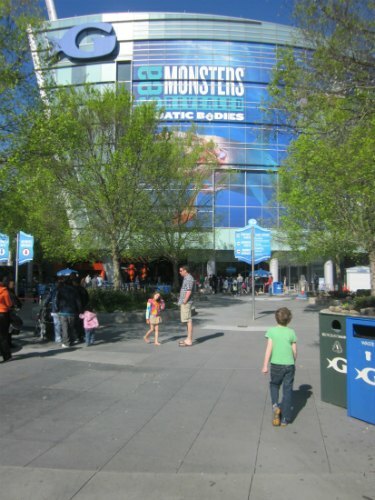 The Georgia Aquarium’s 4D Theater allows you to experience the sea from the view of the animals that live in it by combining digital projection, a high definition animated 3D film and unique special effects. 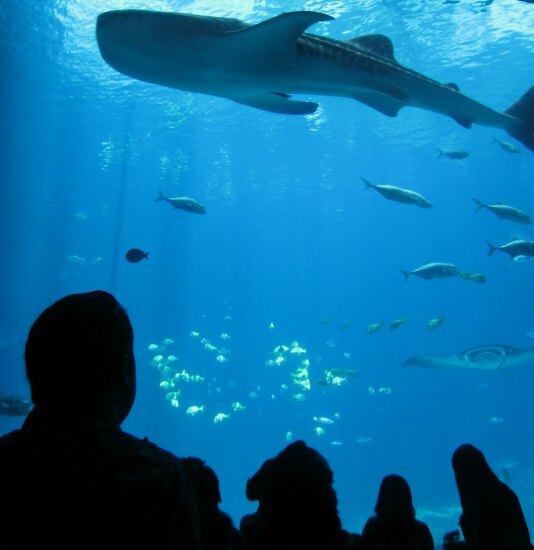 By now, you have probably realized that you should plan to spend the whole day at the Georgia Aquarium. There is just so much to do and see! Tuesday and Wednesday mornings are the least crowded times. Visit early or late in the day to avoid the busiest times. Plan your visit around free activities offered throughout the day such as the AT&T Dolphin Tales show times and Animal Feedings listed at the computer screens outside each gallery. Southern Hospitality Discount- Save $6 on Total Tickets!! Georgia Aquarium is showing southern hospitality to neighbors in Georgia, North Carolina, South Carolina, Tennessee, Alabama and Florida. They invite you to visit for just $29.95 +tax for an adult Total Ticket this spring, until June 13, 2014. That’s a nearly 17% savings on our regular price ticket. Just show your valid ID from one of the states listed above at the ticketing window and tell the guest services representative that you want the Southern Hospitality Discount. Not available for purchase online, as you must show your ID to receive this special pricing. 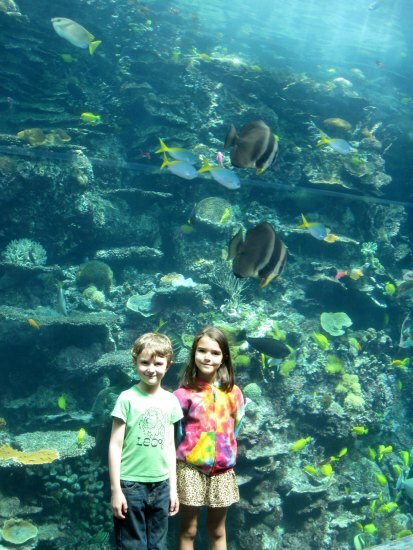 One lucky reader will receive four Total Tickets to the Georgia Aquarium and a parking voucher, so their family can have their own adventure with the Georgia Aquarium in Atlanta. ($153 value) Transportation NOT included. How to Enter: Enter through Giveaway Tools- just sign into the widget and click the entries you want to complete. Winner announced above in the Giveaway Tools widget on May 27, 2014. Winner will be selected through Giveaway Tools and I will notify by email. Winner must respond within 4 days or the prize will be forfeited. Your email will not be shown and will be kept private. I received no monetary compensation. The tickets provided by Georgia Aquarium. All opinions expressed are my own. Sea Monsters Revealed definitely caught my eye! I love the location – it’s right by so many other things to see. I think the “Adults Only” Sleepovers at the aquarium looks like a blast! I love all the pretty fishes. My kids would love to see them. I love that Georgia Aquarium has a Dolphin Encounter, Sea Otter and a Penguin Encounter that it so cool! The Sea Monsters revealed looks interesting! Awesome! This place in Georgia is so cool with the huge aquarium. I’m so excited to visit this amazing place and I bet my kids will enjoy this place. The photo you took with the shark inside that huge aquarium is the one I want to see soon. Thank you for sharing this! I leaned that they have more than1,500 volunteers at the Georgia Aquarium. It is great to volunteer and that would be an interesting educational place for volunteering. You can swin with whale sharks. I like that they offer school programs. Students can participate in an instructor-led program or a self-guided program, Aqua Adventures. I learned that the aquarium has a lecture series including one coming up hosted by Jeff Corwin. That you can spend the night at the aquarium. that is neat! I love the idea of the “Ocean Odyssey” sleepover! How awesome would that be! Their sea otter encounters really caught my eye. I love those animals! Being able to spend the night.